1) They should accept every single piece donated, isn’t this a fund-raiser? 2) Don’t invite artists that do poor quality work. Last year after a couple of long time artist contributors were rejected, I brought up these two things. Of course things did not change. They wanted to have a ‘meeting’ with me about my concerns. I said a meeting was unnecessary, because I told them what I thought and they need to fix the problem internally. Like I said, after a few months I never heard anything, so I sent them a NY Times article about artist donations, and how some ORGS give back to the artists. I still never heard anything, and I am assuming that was the straw that broke the camel‘s back. My donation was rejected this year with 34 other artists. In the form letter they say pieces are picked by quality, saleability, media, and CONTENT (Huh?) but I have a feeling my rumblings had something to do with my rejection and not my art. I worked at the PAV for 4 years, every decision they make is POLITICAL. Every year I try to submit something different and interesting. It’s not that I’m some hack who does close-up photos of tulips or 5-minute abstract paintings. My piece brought $850 dollars last year which is about double of what others artist’s work brings. Two years ago I tied for first place for the People’s Choice award and the year before that I was on the Arts Night planning committee. I guess what I’m trying to say is that I put in my time, and my art is appreciated. I could care less what people pay for it. Don’t get me wrong, I’m all for giving other artists a chance. That was the goal of my art group MAC that I formed a couple of years ago. I think that is actually the positive thing that could come out of this, but it could be handled differently, like rotating artist donations every year, or having two Arts Nights per year. Howard once suggested one before Christmas would be a good idea. I’m finding out more and more though that people who had an education in the arts or arts management have trouble thinking for themselves and exploring new ideas. Apparently, creativity is not a part of the education. 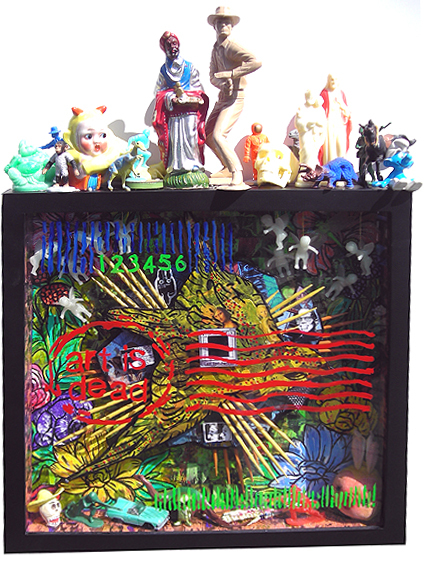 This year I did a shadow box called ‘The day Ray Johnson died’ It wasn’t a political piece, I usually try to stay away from that for Arts Night. It was a tribute to the famous self-taught collage/mail artist Ray Johnson. Ray was anti-establishment, maybe it’s fitting that that piece was rejected. He never had a manager and peddled his art on his own. Maybe the words ‘Art is Dead’ painted on the shadow box glass deterred the jurors from selecting it (you know, that CONTENT thing). It was in reference to RAY‘s death, not art in general, and in a postage mark. Basically I was saying that ‘Mail Art’ died a little the day Ray died. It’s really not a complicated message. I think sometimes people look too deep into my art, I’ve told people it is all on the surface. A couple of years back, a local art critic poked fun at my work because I painted words on my paintings. He felt I was giving something away to the viewer, art is supposed to be giving to the viewer not cloaked in mystery. What if Caravaggio believed that, would he have invented the Baroque style? Speaking of Caravaggio, it makes me laugh that in 2007 artists are judged for their personal beliefs and personal lives instead of their art. Imagine if patrons would have felt this way about Caravaggio? He would have never worked a day in his life. He was quite the hellraiser. Patron’s wanted him for his art, not for his personality. I think that is what it is all about, by banning my art, they are banning me personally. Seems like a silly assertion, but trust me I have had past experiences with the Ol’ Pavilion. This rejection was the last kick in the balls I’m going to take from any art organization, especially the Pavilion, a place that has kicked me twice before. Once when they refused to market my individual exhibit because it may be ‘controversial’ and once when I was passed up for a management position when I worked there because I was ‘too outspoken’. Maybe I’m the stupid one here for continuing to donate. I tried getting out of it two years ago, but was personally asked by Howard and his assistant Erin, and that changed my mind. I was reassured by Erin that my work would probably never be rejected because I’m a long time donator that the VAC appreciated. Apparently times have changed. There’s a new Sheriff in town, David is the new director of the VAC. Howard was filling in until they found one. I have never met David, but he had no problem putting a personal note on my rejection letter that he would like me to donate next year. Yeah, like that’s gonna happen – pal. According to his resume, he’s one of those ART SCHOOL apologists who judge art on it’s appearance. It’s a shame he had to pay for his education. I wonder if his new blood had a little to do with my rejection? I left David a phone message asking who the jurors were, he never called back. An email to him revealed that he was out of town until Monday, according to the auto reply. Seems convenient that he would be gone when all the rejected artists were picking up their work, so his staff has to deal with them. That’s typical of the Pavilion management: The best way to solve a problem is to ignore it. Looks like he will fit in nicely. Make no mistake, the Pavilion is about private money and their donors. The donors shape what goes on in that building and the executive director and employees are merely their minions. I wonder what kind of soap they use to clean their noses? Pretty cool huh? A credit card company apparently got picked. So what’s next? I’m going to insist that the juror names be released or the reason why my piece was rejected. Secrecy only makes my suspicions stronger. This is the Email exchange I had with the Pavilion, I CC the Executive Director on the Final response. No need to call, I work all day and am hard to get a hold of. 1) What criteria did I fail that resulted in my piece getting rejected? since you are a publicly funded institution. The jurors selected are members of the community and friends of the arts. The jurors are anonymous because of the nature of this fundraising event. I guess I can understand (or maybe I can’t) why the jurors need to remain anonymous BEFORE the selection and rejections. But I can’t understand why they need to remain anonymous after the process is over? I have been in several JURIED shows and the juror or jurors are always advertised, usually ahead of time. In fact I have even seen your name as a juror in a couple of exhibits. It only makes my suspicians stronger that my rejection was purely political. And, even if the jurors need to be ‘secret’ why can’t you give specifics as to why MY PIECE was rejected? A form letter is tacky. I have donated to Arts Night for the past 5 years. I was a member of the Arts Night Planning Committee 3 years ago. I won the People’s Choice award 2 years ago and my piece brought $850 last year (double of what half of the other pieces brought in the auction.) I highly doubt my rejection had anything to do with your ‘CRITERIA’. I think REJECTING donations from artists in the community is unwise, as I told Howard and Erin last year after several of my friends were rejected. Secrecy and Censorship is NOT the cornerstone of art – especially in a publicly funded facilty. PS- Save yourself some postage and remove me from ALL of your mailing lists. Like I said above “Secrecy and Censorship” have no place in public art. Sometimes I sound like a broken record when I tell arts administrators about this. When did Neo-Cons take over the Arts? Hopefully this experience will pan out, and I will be able to make a point once and for all about Elitism, Censorship and Secrecy in are the Sioux Falls arts community. I wonder if First Premire will give you a low interest credit card for advertising the artsnight.com bait and switch. Maybe First Premire “hijacked” the url just to piss you off because of you cartoon ‘Sanford and Son’, you big dummy! 25DP is powered by	WordPress 4.0.26 and delivered to you in 0.132 seconds using 33 queries.